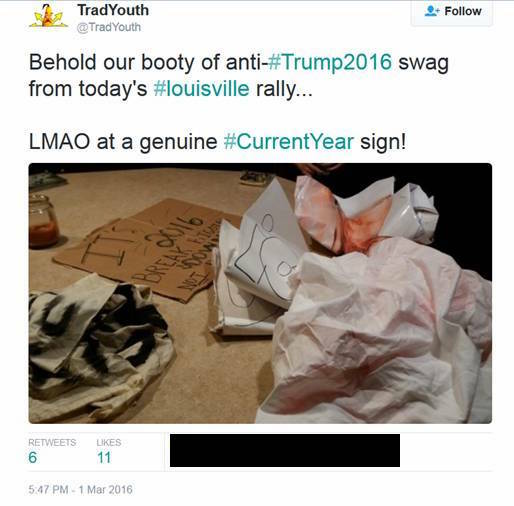 White nationalists and racists are not only boldly showing support for Republican presidential candidate Donald Trump, but at a Super Tuesday rally in Louisville, Kentucky they actually got involved in physical violence with counter-protesters. Heimbach, fired a few weeks ago by the State of Indiana as a child protective services case worker, now apparently has time on his hands to devote to supporting political candidates, including Trump. At Tuesday’s Trump rally, the youthful white nationalist from Indiana and some of his supporters engaged in a free-for-all shoving and shouting match with counter-protesters, some reportedly affiliated with the Black Lives Matter movement. “Honestly, I had planned to merely attend [the Trump rally] as an idle spectator, but the protesters were as hostile as anything I’ve seen at actual [white] nationalist events,” Heimbach said in writing about the incident. “The entire point of the BLM’s tactics is to push people until they push back,” Heimbach claimed. “They’ve actually convinced themselves that these rank-and-file Trump supporters and even Trump himself are synonymous with the Klan, or at least with outright nationalists like myself,” Heimbach said. That’s when he and other pro-Trump supporters got involved in the “heated moment” with counter-protesters captured on videos now making the rounds online. “One [video clip] features yours truly helping the crowd drive out one of the women who had been pushing, shoving, barking, and screaming at the attendees for the better part of an hour,” Heimbach said. Tweet from the TYN account. Heimbach now modestly says he’ll avoid any future Trump rallies “to ensure that I don’t become a distraction,” he said. “It won’t be me next time, but White Americans are getting fed up and they’re learning that they must either push back or be pushed down,” Heimbach said.